Welcome to The Strange Adventures of Margery Jones. “The Strange Adventures of Margery Jones” is a 365-part microfiction serial written in 2011 by Tucker Cummings. The story will always be available online for free, though there is an e-book version available as well via Smashwords for readers who prefer the ease of navigating the story with their e-reader. Read the story from the beginning here. See what Tucker has been up to since 2011 at her blog or on Twitter. This is “The Strange Adventures of Margery Jones,” a microfiction serial written by Tucker Cummings. Margery Jones travels between parallel universes, visiting other incarnations of herself and making irreparable mistakes. At its heart, this is a story about heartbreak, mental illness, and uncertainty. What the heck is microfiction? Also known as very short stories, short-shorts, or drabbles, microfiction tales generally run no longer than 1000 words. Some subsets of microfiction, such as Twitter fiction, are limited to just 140 characters. Microfiction authors love the challenge of creating a world, plot, and interesting characters within such a limited amount of literary real estate. In the case of “Margery Jones,” each chapter is 100 words long. A new chapter was uploaded each day in 2011, as part of an experimental writing project. Tucker Cummings has been writing strange stories since she developed sufficient hand- eye coordination to operate a crayon. Sadly, her handwriting hasn’t improved much since then. There are currently no plans for a sequel featuring Margery Jones. There is, however, an “Easter Egg” Margery Jones story available to read in another collection of my short fiction. This book, written as part of Art House Co-op’s “Fiction Prject 2011,” can be viewed at the Brooklyn Art Library on North 3rd Street. Talk to a librarian, search for my book by my last name, and you’ll find the bonus story tucked inside. At some point, this book should also be getting digitized. Once that happens, you can search for it online here. 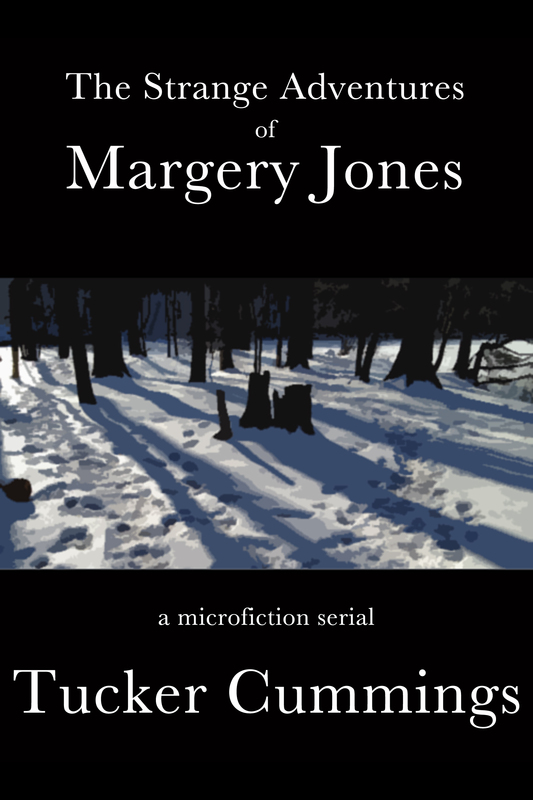 The Strange Adventures of Margery Jones is now available on Smashwords. I know, I know. It took me long enough. After multiple delays, I’m happy to announce that you can finally purchase “The Strange Adventures of Margery Jones” on Smashwords. Don’t worry: you will always be able to read the story here, in it’s entirety, for free. I compiled the Smashwords version of the story so that people who prefer to read on a tablet or e-reader would be able to do so with ease. I think it’s probably a lot easier to read in this format. Smashwords offers the story in a whole range of formats, including PDF, plain text, and RTF. There are also Kindle, iOS, and Nook-friendly versions, as well as versions that are compatible with other e-reader platforms. The e-book version costs 99 cents. Photo credit for the front cover goes to me, though the overall design was done by the amazing Tory Miller. My dearest daughter. I’m sorry I didn’t come home. After your father died, after the accident, I couldn’t bear it. I was willing to do anything to find him, to bring him back to you and make us all a family again. I said once that I left home out of curiosity. Now I can say that I was running away. Away from you, away from pain, away from the comfort of familiar routines. Everyone thought I was crazy. They said it couldn’t be done. We did it. Now, finally, I’m at peace. I’m ready. I’m happy. Adora, broken and embittered, sits on a pile of dust overlooking a railroad depot. Her clothes are ragged, her nails are dirty, and her hair hasn’t been cut in years. Despite all her hopes, her journey is at an end. Her mission was a failure. Her heart once pumped white-hot rage. It’s cooled now. It still aches fiercely. “Where are you, Mom?” she asks the puffs of dirt she’s kicked up. She opens her knapsack and grabs a bottle of lemonade. It’s warm, but still quenches her thirst. There’s clearly something on Ripley’s mind. I don’t know what. We pass each other in a hallway. I’m starting to show at the seams. Casual hello. It’s me, Margery. Act naturally, I instruct myself silently. “Heya, Rips!” I bark, and immediately am sure she’s seen right through to the heart of me. Miraculously, she seems unfazed by my lack of cool. “Sounds great,” I say convincingly. But it’s not going to happen. I have other plans. Ripley and the doc are sitting in Doc’s office, printouts and solid state drives littering the landscape of the desk. Stirrings, always stirrings. Wars are never over. Every pause is just long enough for the faction to catch a breath, then draw a weapon and start the conflict all over again. There are agents moving, always moving, nipping into crowds and leaving behind parcels that will change the game. In any given city, they teem, clustering in schools and plotting revenge. From death springs life. The snake eats its tail, and the circle is unbroken. The pax is over. Our interbellum’s at an end. When the fallen strike back, it will be a fatal blow. Don’t start what you can’t finish. St. Bart’s sacred day is long since past, and yet we still have a fun little shindig to attend. Apparently in my sleep, the doc and Ripley started a tedious little tradition. Day after Christmas, without fail, they throw a little fête for all the hospital staff. It’s a strange thing, to sip warm champagne with a gross of your look-a-likes. My throat is ragged from making small talk, my head aches from chit-chat. How can I share so much of my DNA with these people, and yet hate everything about them? Our wounded little family sits around a plastic tree. A photo of M2 from a time after I fell into my sleep is by Ripley’s feet, and it’s creeping me out. To her left, Doc is pouring us coffees from a thermos laced with whiskey. The gifts sit at the base of the tree, unopened. No one wants to be the first to unwrap one. Once you start, you begin to end. I miss Dora. There’s no way I could go back to her now, not after I abandoned her. But still. Still. Yeah. I’m ready to get out of here.